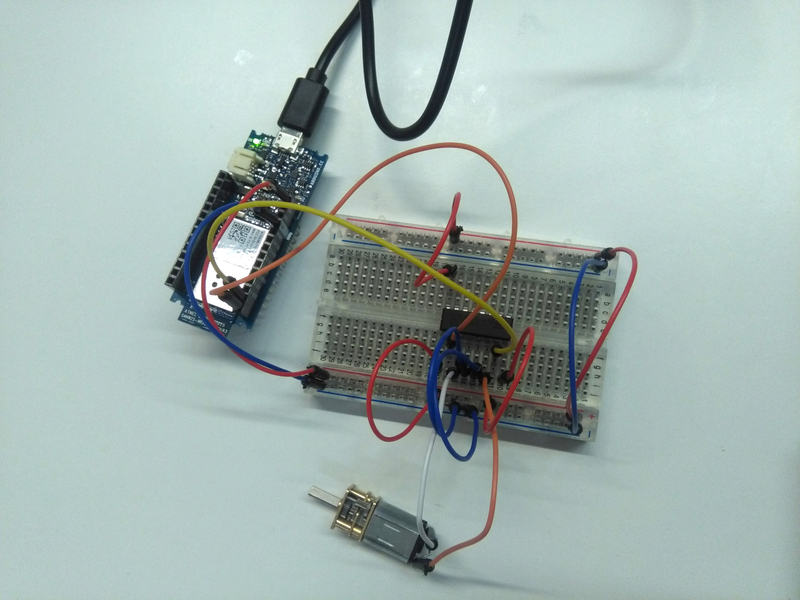 This handy tutorial will teach you how to work a DC motor with an Arduino and an L293D motor driver with some quick connections and a bit of code. In this tutorial, we'll be looking at how to power and drive a DC motor with an L293D and an Arduino (we're using the Arduino MKR 1000 here, but you can use any Arduino that provides enough voltage for your motor and has 2 digital output pins). The L293D is a 16-pin Motor Driver IC which can control up to two DC motors simultaneously, in any direction. First, let's hook up the components on the breadboard. Below, you'll see a pin diagram of the L293D — note the location of each of the pins, relative to the notch at the top. Since we're just driving one motor for this tutorial, we won't be using all of the motor driver's pins. Start by plugging your Arduino into a power source (such as your computer). Connect the GND and 5V on the Arduino to one side of the breadboard, and extend them to the other side with jumper wires. Place the L293D in the center of the breadboard, with half of the pins on either side of the breadboard. Connect 5V to Enable 1, Vss, and Vs on the L293D. Connect digital output pins (we're using 6 and 7) to input 1 and input 2 on the L293D. Connect your Arduino's GND to both GND pins on the same side of the L293D. Finally, connect output 1 and output 2 of the L293D to your motor pins. Note: The Vs pin on the motor driver supplies power to the motor. If your motor requires more voltage than your Arduino can provide, you can hook up an external battery or battery pack. 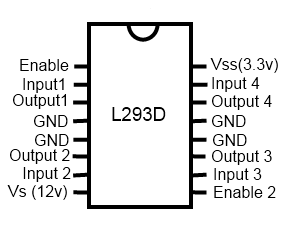 Simply connect the negative lead to GND on the breadboard, and the positive lead to the Vs pin of the L293D. Once the sketch is uploaded successfully, the motor will turn in one direction. If you want to change the direction, simply reverse HIGH and LOW in the loop function.